Yes, presentable is it! I have to admit though that I don’t always fetch the gloves when the spirit moves me to dive right in. But I do pay for it later. Robin, I SO enjoy your posts–informative and fun! Your purchases are most delectable, including the gloves–I have a pair and really like them too, so the nursery where I got them better get more in this year. I also like the ones made by West County, for doing heavier duty work. 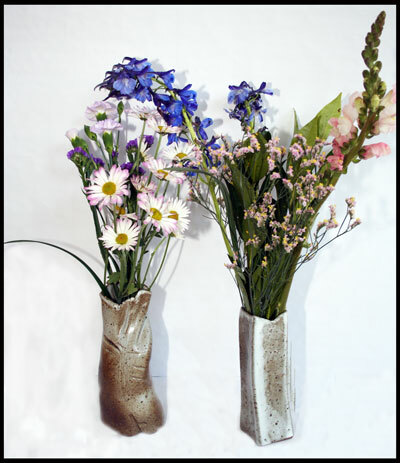 I’ll not call the ikebana police on you if you’ll not call them on me. Rules were meant to be broken, right? Rules schmules. If it’s pretty, it works, right? If I ever decide to become a competitive Ikebana arranger, I’ll read the rules. Until then, there is much too much other stuff to be worrying about, right? Profuse thanks for sharing all your wonderful finds with us. I think your Ikebana arrangement is lovely. Why do you feel that your plants do better in a clay pot, I wonder? I’d just like to know is all. I use clay and (shh . . . plastic) and my clay always dries out. Do you have any tips? Oh, and love the tip about the gloves and the sizing for them. Excellent! The clay allows the roots to “breathe.” This, and the aesthetics, is the reason I don’t usually like plastic pots. Yes, plants in clay pots do dry out faster, particularly when they are outdoors. It’s important to soak a clay pot in water before using it so that the clay doesn’t keep drawing the moisture from the soil. Some people say to just “dip it” in water. 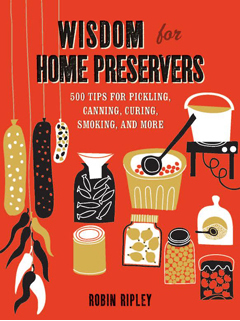 I prefer to soak mine overnight or until I no longer see air bubbles formed on the sides of the pot. Some high-fired clay pots may not give off many bubbles. But the inexpensive pots most of us find at the local garden center really need to have this treatment. If you find that your clay potted plants are soaking up water, just immerse the whole plant–pot and all–in a bucket of tepid water for about five minutes. Make sure it drains really well. Where do you get those Atlas gloves? Have you seen them in a big box store or Target, or can you name some mailorder sources? 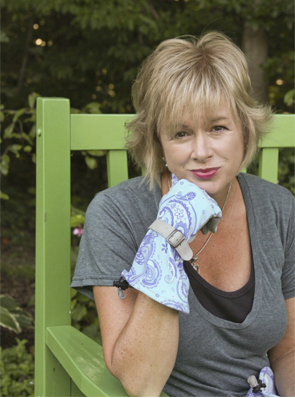 I’m encouraged that Jodi found these gloves at her local garden center. I haven’t seen them there or anywhere else, but I also haven’t been glove shopping. A quick search of the big box hardware stores and Target came up zero. 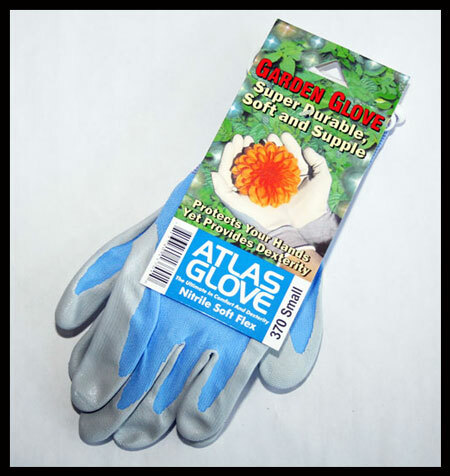 I did find them at: http://www.gardenbasket.com/atlas_garden_grip_gloves_1.html. I don’t know anything about this vendor though. Has anyone else seen them? I might need some more too! Robin, Thanks for sharing all your finds with us. 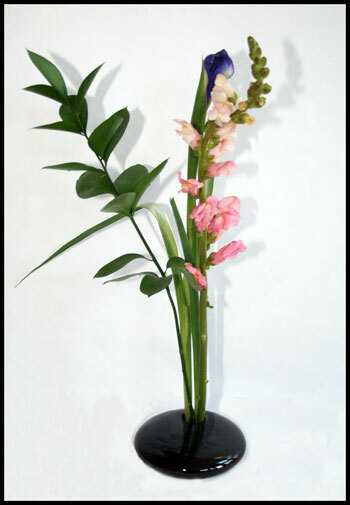 I give you an “A” for your Ikebana display- the snap dragon and the iris looking quite perfect paired together. I’m a bit of a glove junky and always looking for new ones to try. I have some that I love from Smith and Hawkin but they are a bit pricey and never last as long as I wish. Your punch list is exactly the same as mine for requirements and the price works for the atlas. It’s a good thing you gave the sizing tip- I have large hands too– Oh that I was 5′ 10 to go with them. Big Sigh. I love Atlas gloves! I usually buy a couple of pairs at a time as I always wear them out so quickly. I’ve found them at nurseries, but never at big box stores. I too enjoy digging my hands down in the dirt. I don’t like it underneath my fingernails, but there is always soap and time cures a lot of things! Terra cotta is a favorite of mine also. It is hard to find interesting pots, though. And if you do, they want the moon! Good stuff in this post, Robin! Do those Atlas gloves come in purple? 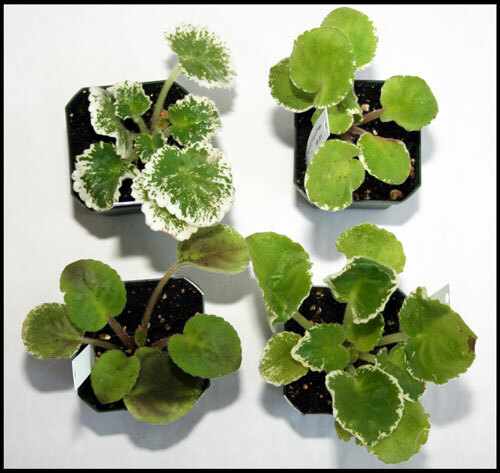 I love your African violets! I didn’t know there are varieties with variegated leaves. I don’t have a place for them in my house, so you’ll have to post pics occasionally so I can enjoy yours! There were several colors of the gloves that I saw. I don’t recall about the purple though! Nice finds. It looks as though you hit the jackpot finding those clay pots. They are gorgeous. I like clay pots too. CAn you leave these outside during winter or do you have to store them? I have run out of storage space so I have been buying the glazed pottery that you don’t have to store. They look nice sitting in the garden during winter to add a little color to the gray landscape. I especially liked the clay pots. They were not only unusal looking but seemed to have some height to them which I like. 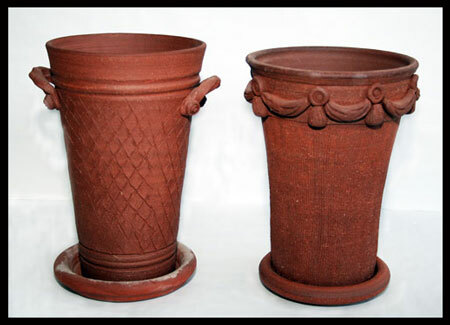 Their vertical orientation would be a nice contrast to most horizontally orientated clay pots. these discoveries are always so valuable. can’t tell you how much they’ve come in handy. thanks. Love your website Robin. I have a contact that is to send me some Trailers this fall. I have 5 new violets rooting now.